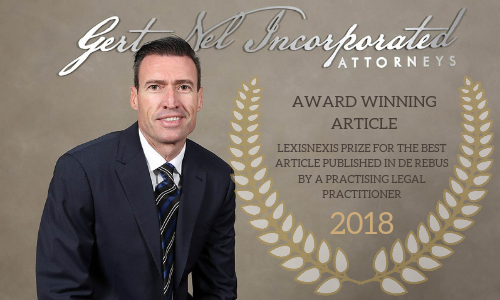 We are proud to announce that our very own Mr. GEP Nel (Director) won the 2018 LexisNexis prize for the best article by a practicing legal practitioner, published in the De Rebus. The article addresses the issue of legal fees on a Contingency basis (read more here). Gert Nel Inc. is a firm of specialised personal injury attorneys committed to ensuring top results not only by obtaining sterling capital settlements, but also by maintaining the dignity and integrity of our very special clients long after their matters are finalised. Personal injury is a traumatic event. The administration involved in making a claim can be daunting for most people, particularly when trying to cope with an injury, or loss of a loved one. We strive to treat each and every client with the respect and care that they deserve and to make the experience as effortless as possible. The secure Gert Nel Inc Claim App makes it even easier to access and receive an update on your claim, anywhere anytime on your mobile device or desktop computer. Gert Nel Incorporated has partnered with ICE ID to offer our clients and the public at large the opportunity to secure a sought-after, branded Gert Nel Incorporated, ICE ID at a 20% discount, in a choice of “Sky Blue” or “Black”. The law is changing – victims of road accidents will be receiving less in terms of The Road Accident Benefit Bill (RABS when it becomes law soon), regardless of how bad their injury is. Hear how this will affect you. Also, all your questions posted on LegalTalkSA. 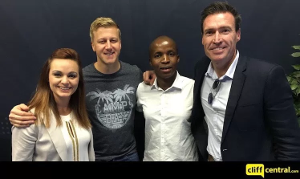 The guest in studio is Specialist Attorney on road accident injury claims, Gert Nel of Pretoria. Ek wil net baie dankie sê vir wat jy vir my gedoen het, en jou personeel ook. ‘n Dankie aan al die mooi dames. Beste Meneer Nel. Graag wil ek Madeleiene Hechter en die res van u personeel uit my hart uit bedank vir julle puik diens. Ons is met elke klein dingetjie geduldig hanteer en alle inligting was verstaanbaar deurgegee. Ons is soos familie op die hande gedra. Ons eis is dadelik verwerk, ons was gereeld op hoogte gehou van enige verwikkelinge en Madeleine was elke tree saam met ons. Al was dit net telefonies, ons het geweet sy gee om. Maryke Weder het die skikking soos ‘n yster hanteer en ons kon nie vir beter verteenwoordiging gevra het nie. Dankie Gert Nel. U personeel is hartsmense en wat julle firma vir ander doen…verander en verbeter lewens. I would just like to thank you all for the professional and slick operation. Jonathan, Christiaan and the office drivers were on time, polite and friendly and I felt safe at all times (on those city roads this is amazing). Pine Dew Guest house was excellent – the staff , rooms, food and drivers were very good and they took care of our every need. It was a pleasure to get back to the peace and quiet every evening after a busy day. Altogether it was a stress free, well organized operation. Thank you for coordinating us so efficiently. I just wanted to take this opportunity to say a BIG THANK YOU to Gert Nel Attorneys team, from the bottom of my heart. I truly appreciate everything you have done for me. Just received my last payment yesterday. This attorney is brilliant and professional. It’s the best attorney I have ever worked with. I will gladly make use of their services again and refer anybody to him. Ek het verlede week ‘n klient van julle gesien uit die Noord Kaap – ‘n ene Mnr Afrikaner. Hy het met die grootste lof van ‘Mnr Nel’ gepraat en het net verstel hoe goed jy vir hom was en hoe goed jy hom behandel het. Hy het ook gese dat as iemand in sy teenwoordigheid ‘n lelike woord van Mnr Nel sou se, sou hy daardie persoon summier op sy plek sit. Ek weet nie of jy gereeld sulke terugvoer kry nie, maar ek’t tog gedink en wil darem net laat weet jy het ‘n ‘fan’ in Olifantshoek…..
My husband Jacques and I would like to thank you all for the hard work and effort that you put in during the court case. Please accept our gratitude for all the work that you did for us during our difficult time. This makes a whole change in our lives as we are staying in a much better suburb. Let me take this opportunity to thank you and your staff members for the extra mile you showed to me. refer people to you in future. I appreciate a lot God bless all. “We are grateful for being able to help! More Gert. Dankie vir alles vir die week. Dankie dat ek betyds was vir al my afsprake. Spesiale dank ook aan Veronica, Theo en Christiaan. God seën julle diens…..dankie. I’d like to thank you and your team for helping me out with my claim from the RAF. It was an easy journey for me, because I chose the right Attorneys for the process.